I cannot believe we are already finishing up our third quilt in the Scrap-A-Palooza scrap series! My how time flies when you are having fun! I can actually say I am finally seeing the tiniest of dent in my scraps...now that is something to celebrate! If you are ready to sew up some of your scraps, all of the quilts from the series can be viewed in the Scrap-A-Palooza quilt gallery tab above. Not only can you see the quilt I made but I love to share what others have done. There is all sorts of inspiration! In Part One, we narrowed our colorways and pulled our scraps. My full color bins inspired my fabric choices on this one! We also spent the first week cutting our strings to length. Last week in Part Three, we put our blocks up on the design wall and picked a layout. After some easy piecing, the top was completed. And as always, we talked about some possible quilting ideas. I decided to go with a more random layout. This quilt is great for using up those bright colored strings. It goes together so quickly and easily! I did take the easy way out on the quilting of this one. I just used a playful "Popcorn" pantograph. I knew I was going to be quilting this one up in the wee hours of the morning so I went with something that didn't require a lot of thinking. And you need to wear your sunglasses to view the back! I knew this older floral fabric would find a home eventually. Alycia is working on her final layout. She has named her quilt 'Sticks'. I think this one has a very patriotic feel to it. You can see her other layout options on her blog. And Barb over at Mountain Quiltworks just finished up this fresh looking quilt! Rather than choose a specific color for each block, she went with a more scrappy look. All those lovely pastels, just in time for Easter!! One of my layouts for this pattern has inspired the project for April. We will be working with just two colors and a background fabric. Hope you check back to see what I have up my sleeve. Why Scrap-A-Palooza? Because Quilting is more fun than Housework! And in case you missed it, I am hosting a giveaway for my readers! Hop on over here to enter! 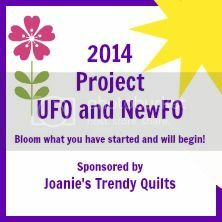 This quilt is one of the NewFOs I had on my 2014 Bloom Project list at Joanie's Trendy Quilts so we can check the March Scrap quilt off the list!. I will also be linking up with TGIFF, Richard and Tanya Quilts, Crazy Mom Quilts, Scrap Basket Sunday, Sew Can She, My Quilt Infatuation and Confessions of a Fabric Addict. 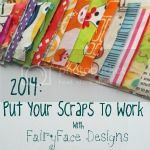 If you are sewing along, don't forget to link your Scrap-A-Palooza quilt over at FairyFace Designs for Sarah's Put Your Scraps To Work series. 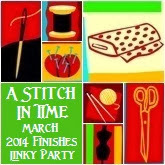 And a final entry into A Stitch in Time March Finishes Linky Party. That floral backing is perfect - a rainbow! Thanks again for hosting this quilt along! the random layout is fantastic, and that backing fabric rocks! Love your colorful scraps - beautiful quilt! What a beautiful quilt. Such quick and easy piecing too. Thanks for linking to TGIFF. Great use of scraps! I've been into that lately, too. Terrific backing fabric. Thanks so much for the great pattern - LOVE your colors!! Love that backing!!!!!! And the quilt 'pattern'!!!! Lovely finish!!!!! This one is definitely going on my list!! Love it - yours is so colorful! Thanks for the idea to use up my scraps without looking too scrappy. I find random difficult. And thank you for all the links to the previous parts. I tuned in late and was glad for the summary. Great looking quilt and I really like the option to create different color ways for a somewhat organized, planned look. Wow, that floral backing was perfect for that quilt! I love it! Thanks for this quick pattern! I'm cutting my triangles for the quilt a long and am ending up with some really fun strips!!! What fun, Love the back! Nice way to use up the long scraps! Love how the white sets off those bright colours and the backing is fabulous too. What a great scrap quilt! :) Love how it turned out! These are all very pretty. Love all the colors in all of them. This makes me want to pull out my strips and make one but right now I am sewing clothes and into making jeans and some skirts for myself - need to finish that first. I am IN. LOVE. with this quilt! The colors are amazing and what a great way to use up strings and scraps! The quilting is just right and I also love the back -- it is so perfect for this quilt. Congrats on a beautiful finish & thanks for linking up! Love the palette you chose! I'd love to see you join link up with us at the Inspire Us Thursdays! link party at www.theinspiredwren.com. I've just met you at Pinterest and I'm in love with your quilts already! A Big Thanks in the form of a Giveaway!